The fifteenth at Devil’s Lake is a 347 yard par 4. Teacher’s Comments: Faded, but charming. 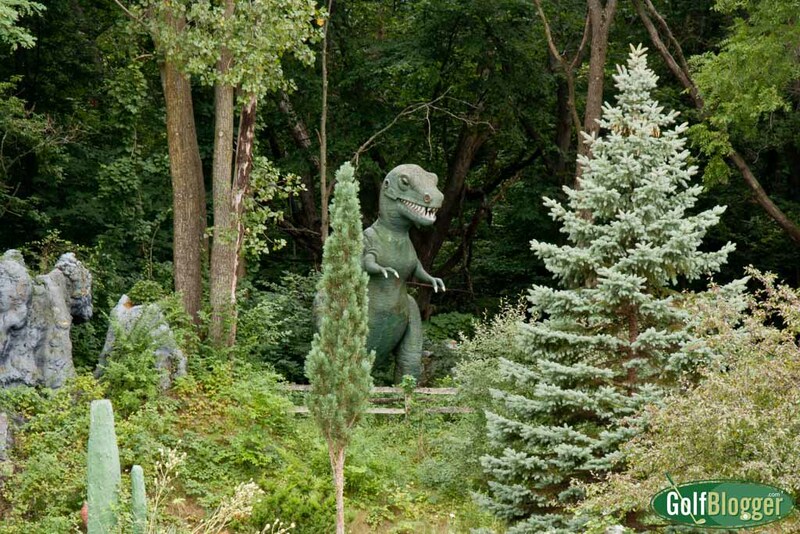 An abandoned dinosaur amusement park in the Irish HIlls. Devil’s Lake golf course dates to 1927, and like much in the Irish Hills of Michigan likely was quite the thing in its day. However, the large number of tourists that used to flock to the area from Detroit now are mostly absent, and the tourist attractions gone or fading. The good news is that at this point, Devil’s Lake doesn’t pretend to be anything other than an inexpensive neighborhood course. 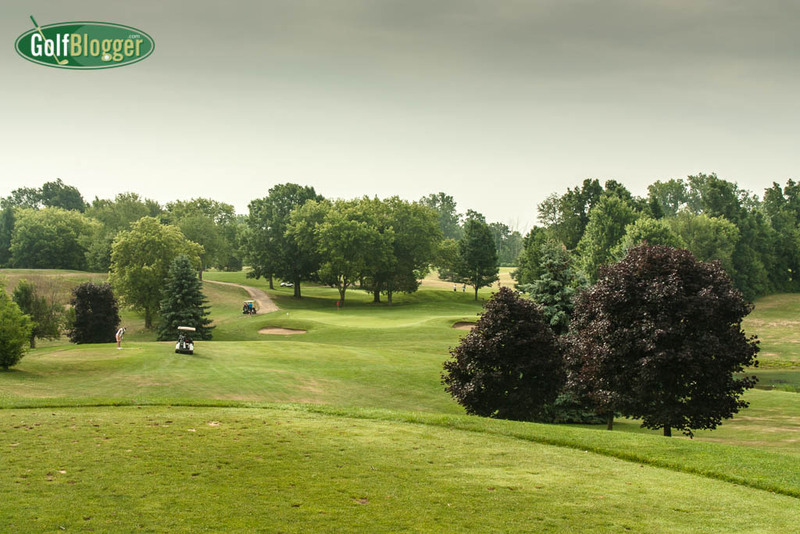 On Wednesdays, you can play 18 holes with a cart for $18. For $18, a player can actually have quite a good experience. Sixteen of the eighteen holes at Devil’s Lake are straight shots. Elevation changes, however, make them more interesting (it is, after all , located in the Irish Hills). The first, for example, runs sharply downhill, then up again to the green. The second is a short uphill par three. The third, has a dip over which the tee shot must carry. Four is straight and flat, but five is a hilltop to hilltop par three. And so it went. By my count fourteen of the eighteen holes involved elevation changes — in some cases, rather significant. Devil’s Lake does not have a GAM course and slope rating (at least there none in the GAM database), but I’d venture it would not come out as particularly difficult. At the tips, Devil’s Lake plays to 6, 019 yards. This is one course where the bogey golfer should play from the tips. Fairways were very generous, especially considering that the rough between fairways constituted no particular hazard. Treelines generally should not come into play. I counted only two fairway bunkers; water comes into play on only three holes. Players therefore should have a lot of fun taking a rip at the ball off the tee, then taking another rip at the green. My favorite hole at Devil’s Lake was the most atypical of the course. The seventeenth is a par five dogleg left measuring 477 yards. 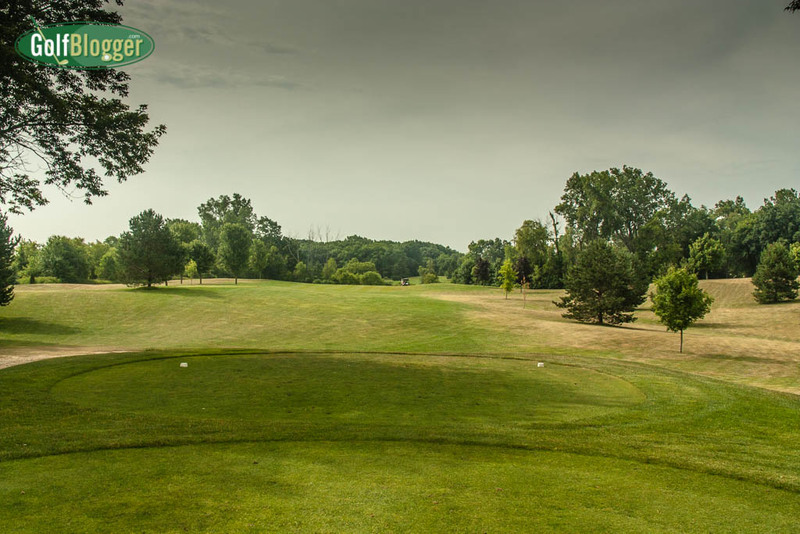 A good tee shot will land somewhat short of the treeline in the distance, but in the center or to the right of the fairway. That sets up a second shot through the trees, over a marsh, downhill to the narrow fairway. The third can then go into the largish green. Conditions on the day I played were somewhat better than you might expect from a buck-a-hole course. Fairways were mowed, and filled in (albeit with lots of weeds); the greens were smooth. There was, however a very strange thing going on with ants. 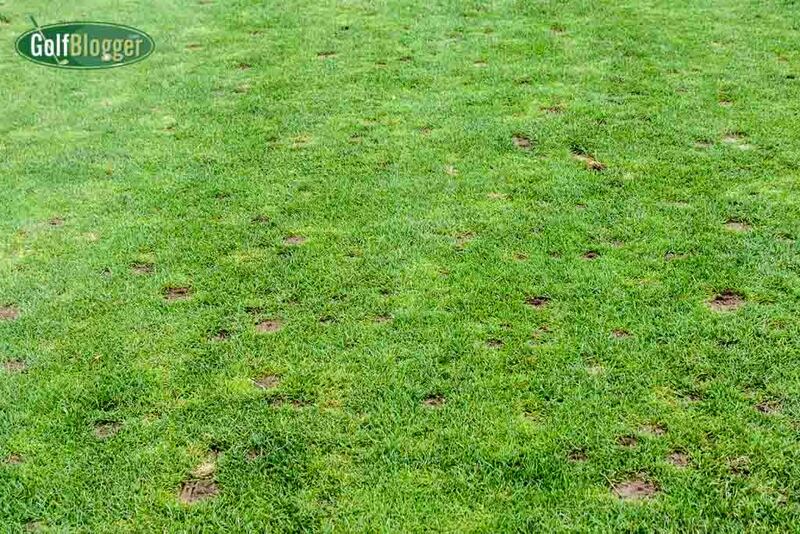 A number of the fairways were completely overrun with ant hills. If this course were in Florida or Texas, where the fire ants reside, it would be the setting for a horror movie (especially considering the course name. Imagine the “B” movie title: The Horror At Devil’s Lake. Devils Lake golf course must make a tidy living from leagues and outings. I teed off on a weekday at 7:30, just ahead of a large league. The course has a cozy clubhouse that could comfortably seat forty, and a bar. There’s also a large picnic pavilion area. I can see local charities holding outings here on a regular basis. I enjoyed my trip to Devils Lake golf course, especially considering the price. 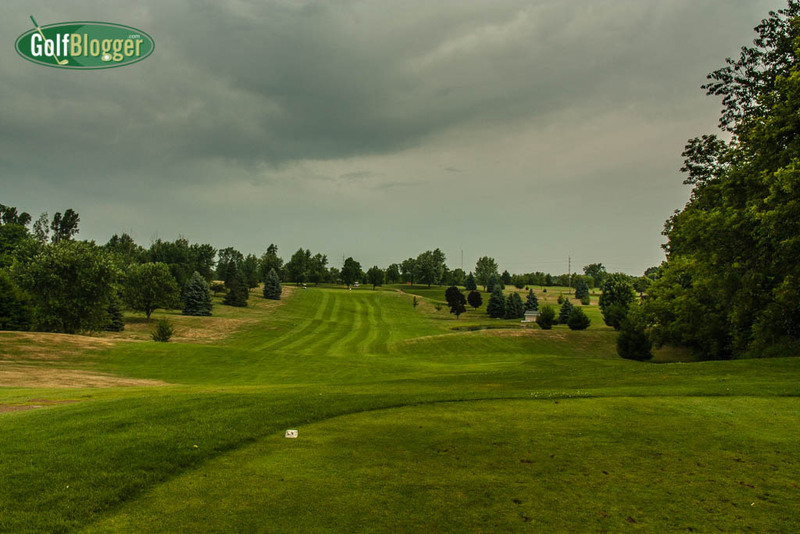 I would not go out of my way to play there, but locals should find in Devil’s Lake enough golf for their everyday needs. The Devil’s Lake Golf Course Review was first published July 22, 2016. The first at Devils Lake is a 330 yard par 4. The second at Devil's Lake is a 121 yard par 3. Devil's Lake Hole three is a 518 yard par 5. The fourth at Devil's Lake is a 391 yard par 4. The fifth at Devil's Lake is a 157 yard par 3. Devil's Lake hole six is a 392 yard par 4. The seventh at Devil's Lake is a 495 yard par 5. The ninth at Devil's Lake is a 186 yard par 3. The Tenth at Devil's Lake is a 404 yard par 4. The twelfth at Devil's Lake is a 548 yard par 5. The thirteenth at Devil's Lake is a 159 yard par 3. The fourteenth at Devil's Lake is a 400 yard par 4. The fifteenth at Devil's Lake is a 347 yard par 4. The sixteenth at Devil's Lake is a 295 yard par 3. The eighteenth at Devil's Lake is a 270 yard par 4. The eleventh at Devil's Lake is a 337 yard par4.